Chupke, chupke raat din, aansoon bahana yaad hai. Ghulam Ali Sahab was a regular at home. He’d be closely followed by the Late Mehdi Hassan who crooned Beqarari si beqarari hai. The tempo would then be taken several notches higher by Abida Parveen’s Dama Dum Mast Kalandar. This pretty much was a set routine every other evening. Dad, thus, introduced me to the world of Ghazals, and thereby to the brilliant musicians who crafted such soulful melodies. “Have you seen Bakra Qiston Pe? It is hilarious.” I overheard the girls talk in school. Why would anyone buy a goat, and that too on installments? I wondered. Many years later, when the teens landed up unannounced at my doorstep, I had an Epiphany moment. I was introduced to Strings, the Hot Pakistani Band. With my eyes closed and my heart beats willing to compete with a wild horse, I savored every word. Faisal was singing my love song, Sar kiyae yeh pahar. And this, he sang to me everyday. It still remains one of my all time favourite songs. So over the years, as you can see, Pakistani content infiltrated our lives. However, we were not complaining. In fact, I think the rustic art and authentic melodies found eager patrons on this side of the man-made borders. 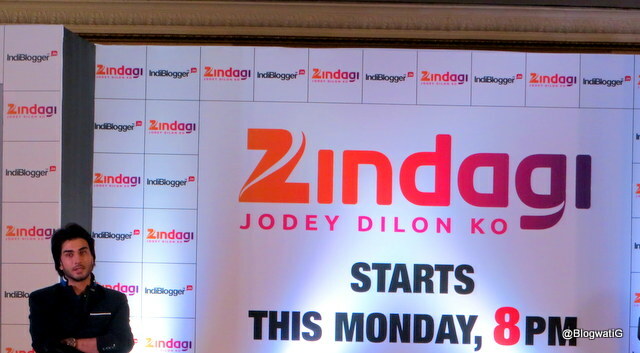 And so, when IndiBlogger announced the #JodeyDilonKo meet along with Zee Zindagi, it seemed like a wonderful opportunity to get a sneak peek of the neighbourhood. Armed with my photo identity proof, I was on my way. 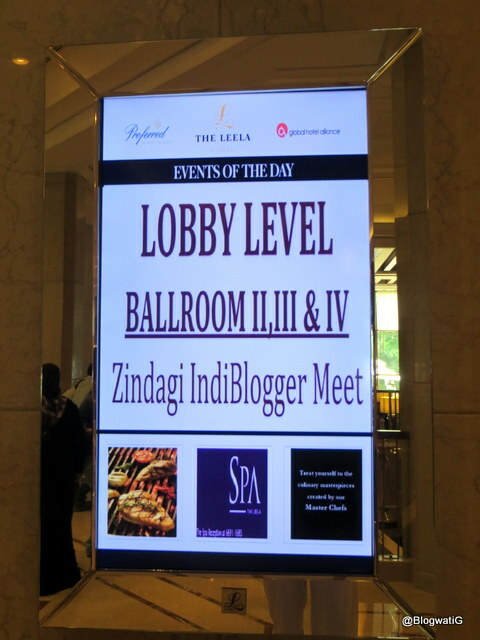 IndiBlogger meets are anything but synchronized to a flow chart. They are impromptu and we love that about them. This time, they decided to feed us before we went ballistic. Smart move. So, post lunch and pleasantries, we were ushered in to the banquet hall. The meet was happening simultaneously in Delhi as well. While we caught glimpses of them on the big screen, and they of us, a Mumbai-Delhi face off was inevitable. The two cities battled for the title of the ‘better bet’ in various categories and bloggers rose to the occasion, from their designated seats that is. Each side thought they were better, largely to the inaudible video feed at times. But then again how do you compare an apple to an orange? One is product innovation, while the other is a network that, allegedly, follows you everywhere, almost! Thankfully, Team IB realized that swords were about to be drawn, virtually. They quickly introduced Team Zee Zindagi. An offshoot of the Zee Entertainment Enterprises (ZEEL), Zindagi, the new GEC (General Entertainment Channel) in town will go on air on June 23rd, 2014. It will showcase the best content from Pakistan, to begin with. Zee Zindagi is an initiative that stems from their revamped corporate philosophy, ‘Vasudhaiva Kutumbakam – The World is My Family’. 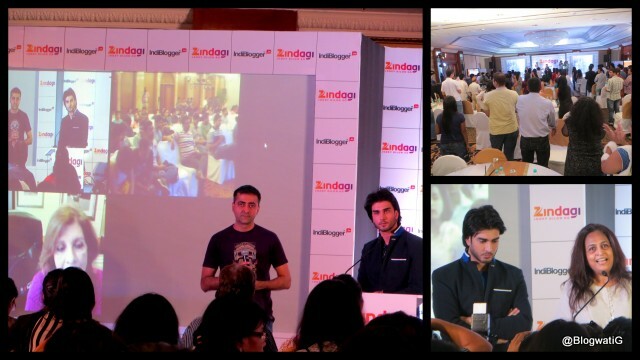 So while Shailja Kejriwal, Chief Creative – Special Projects and Ms. Priyanka Datta, Business Head – Zindagi & FTA Cluster, took to the mic; all eyes waited for Imran Abbas Naqvi to make an appearance. And the lad did not disappoint. His boy band looks, impish smile and bratty sense of humour had the desired effect. Add to that his impeccable Hindi interspersed with delicate Urdu; to a city where the local dialect has become ‘Bumbaiya’, his oratory skills were like a breath of fresh air. When you talk India-Pakistan, the aggressive passion cannot be sidelined. And even as this was a content driven meet, Imran dodged the cross border questions with essayed ease. At no point did he glorify or undermine any side. Some of the things he mentioned stayed back with me. He spoke about a time when he adjusted terrestrial antennae to get the Doordarshan transmission back home. Bollywood has an equal number of fans, if not more, in Pakistan, he said. It took me back to a time when a certain song about Madhuri Dixit was doing the rounds. He introduced Sultana Aapa (on a voice call from Lahore) who runs a successful entertainment network, as the face of the Pakistani woman. And, also, as the woman he owes his career to. At that point, as the applause reverberated in the hall, I wondered, why these stories never made it to the media? Stories of grit and determination to follow a chosen path, and then, excel. A little birdie then told us that Imran was an accomplished singer. We demanded that he sang for us. He obliged with two songs, though, we really would have loved to hear something sufiyana from his side of town. None the less, the rendition of ‘Aisa Des hai Mera’ from the apt Veer Zaara, followed by ‘Tum Hi Ho’ from Aashiqui-2, a movie he missed being a part of. The discussion then veered to why Pakistani talent was and is appreciated to the extent that it is. Sultana Aapa managed to give us some insights where she mentioned that Casting and Content went hand in hand. She shared that she was very stringent about choosing who essay her characters. If her cast were going to connect they would need to be real. She also ensured the graph of each character was time bound.Thus effectively, the story never went beyond a set number of episodes. There was a definitive beginning, middle and end. Yes, a lesson that maximum Indian daily soaps that follow ‘the Bold and the Beautiful’ template can make note of. The meet rounded off with high tea and the usual spate of questions and answers. I still had a few unasked questions. I had the good fortune of meeting Mr. Akash Chawla, ZEEL, Marketing Head National Channel, who was more than happy to answer them. When I asked if they faced any challenges in bringing Pakistani content to Indian audiences, via the I&B, he answered in the negative. In fact, he said this move has been welcomed and they are looking at getting Turkish, Bangladeshi, Egyptian and Latin American content, in due course. He went on to further state that they would be looking at content creation as well with a cross border team. I mentioned to him that I had been receiving the test signal of Zee Zindagi for sometime now. And that I was really looking forward to Aunn Zara and Kaash, Main Teri Beti Na Hoti. He said that I should also watch out for Zindagi Gulzaar Hai. I made a mental note of that piece of advice. And having watched the promo of Kitni Girhain Baki Hain earlier in the meet, I had added that to my to-watch list as well. And as I headed home, my mind a meeting place of a thousand thoughts, I couldn’t help but ponder. I realized History is undeniable. At the same time, History is also not a choice that we have made. Given a choice, people simply want to connect and create good times. Art and culture are universal languages. Good stories are good, irrespective of where they come from. They come from anyone who is willing to narrate them. They come alive with anyone willing to listen to them. Stories belong to people just like you and me. I am hoping that a country whose Prime Minister invited his neighboring counterpart to witness his swearing-in ceremony, will open their homes to this initiative. That this will be a fresh perspective on acquiring content, lawfully. That this will bridge the gap, one home at a time. That this time, we will choose the history that we want to leave behind. As for me, all I can say is Zindagi, mere ghar aana, aana Zindagi. Hey there. I love Sar Kiye Ye Pahar too. Not many people here have heard this song. I’m a huge fan of Pakistani music. I could recommend a fairly big list of Pakistani music artistes/bands – Aaroh, Vital Signs, Mekal Hasan Band, Sajjad Ali, Noori, Ahmed Jehanzeb, Fuzon, Quratulain Balouch…and many more. Watch out for the lead in the show ‘Zindagi Gulzar Hai’, Fawad Khan. he happens to be the frontman of a very popular hard rock/metal band named ‘Entity Paradigm’ or EP. I and my siblings were all born in Kuwait, where my parents worked. My dad had a lot of Pakistani friends out there. I wish my dad was a blogger. He’d really have enjoyed the program, and would have definitely shared his experiences about Pakistanis. Ah, happy to know that you love ‘my song’ too. Oh yes, they do have some amazing talent out there. I will watch out for Fawad for sure. Had no clue about him being in a band, thanks for the info. I will be glued to Zindagi only for Imran. A nice wrap up of the meet. I have heard a few pakistani bands and I like their music especially the sufi ones and the qawallis.. I dont get this in uk so not sure how to check it out maybe on internet somewhere ..